raisin nut balls for kids and pregnant women. Some kids do not like to eat dates in any form and even in the form of date nut balls. Today’s raisin nut balls or ladoo are very much for such kids. I have used pistachios, but you can use peanuts or walnuts or any oily nuts. These do not need any ghee or oil and no added sugar or sweetener except for sauting. Doesn’t this sound good? Back home in India, these were prepared by my mum with peanuts, but since I do not like the kind of peanuts available here in Singapore, I make them with whatever nuts I have in stock. 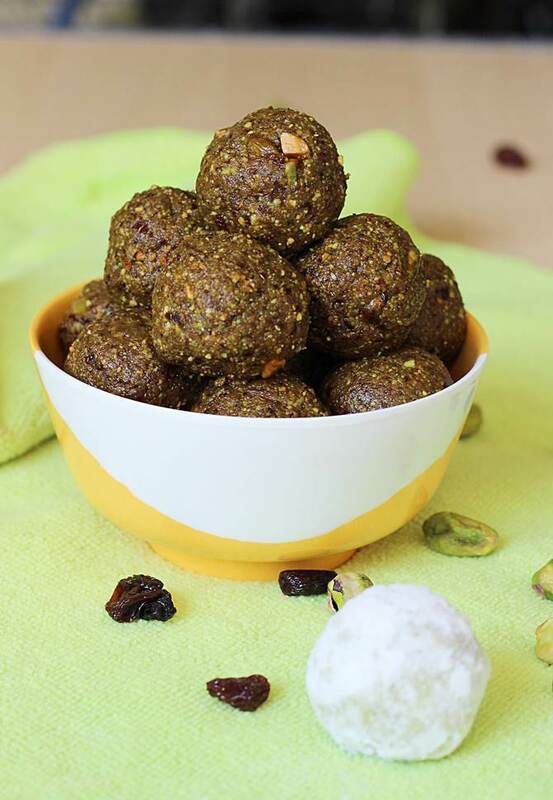 The most interesting thing is these balls are said to increase the immunity and appetite since a major portion of this ladoos contain raisins. My personal experience says givng kids one to 2 balls a day, 45 mins before a meal makes them feel hungry and they finish the meal without much fuss. Suitable to toddlers from 1 year on wards a small quantity if not allergic to nuts. These balls are helpful in alleviating morning sickness in pregnant women, if consumed early morning. Wash raisins in lot of water quickly and thoroughly, several times. This is done to remove the oil or stabilizers that are used to increase the shelf life. Drain and pat dry them on cloth. Fry these in 1 tsp ghee till they begin to puff up slightly. Wash and dry roast the nuts, set aside to cool. Powder the nuts to a fine texture or slightly coarse will do, set this aside. Grind the raisins, cardamom powder in a blender to as smooth as possible without adding any liquid. Add the nut powder to the raisin mix and grind to blend well, you will have a moist mix. I add few tiny chunks of nuts to this mix before i roll them. 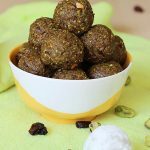 Take small portions of this mix and roll them in your palm to give a ball shape. Store these raisin nut balls in a dry and clean air tight jar. I do not know the shelf life, since in Singapore everything has a short shelf life. I have never stored them for more than 4 to 5 days. If refrigerated will last longer. Handle them with moist free hands.